Whether you’re still learning what robo-advisors have to offer or you’re an experienced investor, you’re probably looking to save money in investment fees. 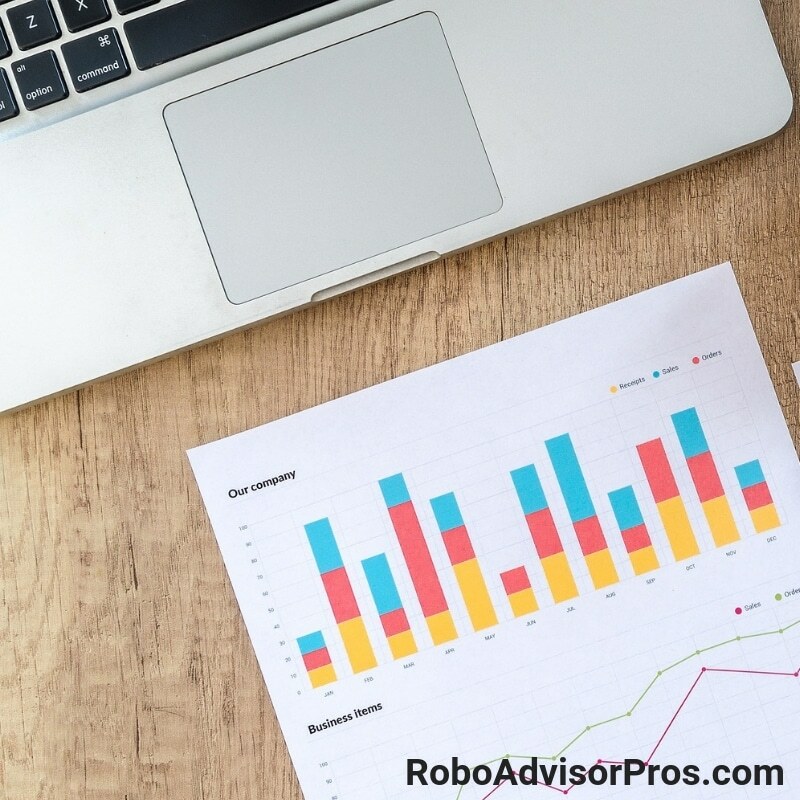 The good news about robo-advisors is that with little to no overhead costs, the savings get passed directly to investors. This means that robo-advisors fees are lower than most traditional financial advisors. So if you’re seeking investment management help, without paying a high fee, then a robo-advisor might be for you. Still, not all robo-advisors have the same fee structures. While some robos offer zero management fee options, others have sliding scales depending on the value of the portfolio they manage. To make it easier for you to choose from the myriad options, we’ve compiled a list of robo-advisor fees from lowest to highest. All robo-advisor management fees are listed as a percentage of assets under management (AUM). So, if you invest $1,000 and the fee is 0.25%, then you will pay $2.50 per year to have your money managed. Bonus; Robo-Advisor vs Human Financial Advisor – Which is Best? 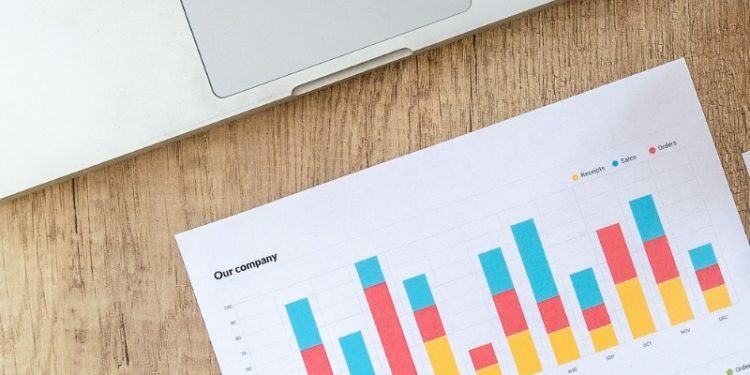 To help you make an informed choice, you’ll also see a brief overview of each robo-advisor, including minimum balances, the types of accounts available to investors, and whether or not you can expect access to a human financial planner. Robo-Advisor Fees Wrap Up: You Have Options! Fee Structure: No account management fees. Overview: With no account management fees, M1 Finance boasts some of the lowest fees around. This robo-advisor also has a very low entry point, with only a $100 minimum investment. Unlike other robo-advisors, M1 allows you to choose from thousands of types of investments or pre-made portfolios. 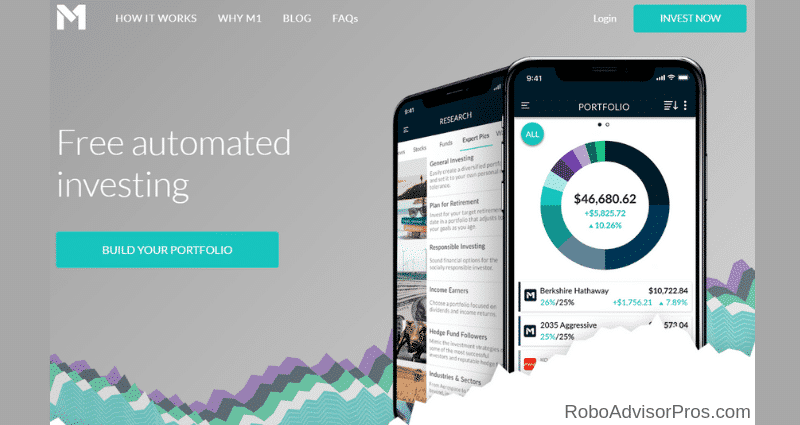 This makes M1 Finance an easy first choice for investors looking to test drive robo-advisors. Advice and Account Types: While this robo-advisor doesn’t offer any financial advice options, users can create multiple accounts like IRAs, taxable accounts, and LLC business accounts. Overview: Schwab Intelligent Portfolios builds your investment portfolio, based on your risk preferences, manages and rebalances your investments. With over $33 billion assets under management, this free robo-advisor does the investment management job efficiently. Taxable accounts valued at more than $50,000 are eligible for tax-loss harvesting as well. Advice and Account Types: For quick questions you can stop by a branch, email, or phone a financial advisor representative. For in depth Certified Financial Planner access, the Schwab Intelligent Advisory option is available for a low 0.28% management fee (with $25,000 minimum account balance). Fee Structure: For 0.25% AUM for their Digital plan; 0.40% AUM for their Premium plan; with 0.10% discount for accounts valued above $2 million (0.15%-digital and 0.30% premium). Overview: Betterment has no minimum required balance, which makes it easy to get started investing. Tax-loss harvesting and retirement planning are available. And Betterment has a wide range of diversified investment funds and offers a free investment check up. The Betterment robo-advisor offers a several service plans so that users pay only for the features they want. They also offer a la carte financial planning packages. Advice and Account Types: Investors who use the Premium plan will have access to a human Certified Financial Planner. All investors can text with financial planners. Betterment offers investment, retirement and trust accounts. Fee Structure: Free for the first $5,000; fees of 0.25% AUM on accounts valued over $5,000. Overview: With a $500 minimum investment, Wealthfront is another robo-advisor that is accessible to investors at all wealth levels. Even after fees kick in, Wealthfront’s 0.25% fee places it near the top of our list of robo-advisors fees from lowest to highest. Advice and Account Types: Wealthfront offers automated investing advice to help your financial planning. Users can also choose from accounts such as IRAs, 529 College Savings Plan accounts, and trusts. The Path investment advisor is a digital-computerized substitute for a human financial advisor. No fees for the basic account management plan. Overview: Wise Banyan has offerings for multiple price points. For instance, Portfolio Plus investors can now access multiple investment options that cover specific industries and sectors. All investors will receive portfolio management, automated financial advice, goals-based planning and investing options, and automatic rebalancing. Wise Banyan’s minimum investment is only $1, so this robo-advisor is quite affordable. Advice and Account Types: Financial advice is automated and online. Wisebanyan offers individual investment accounts. Their retirement accounts include Roth, traditional, SEP & rollover IRAs. *Axos Financial acquired WiseBanyan in October 2018, so there may be changes in the future. Fee Structure: Digital (without investment advisors) 0.25%. The Premium account includes access to human financial advisors and career coaches for 0.50%. Overview: Ellevest requires no minimum balance to get started. This robo-advisor is unique because it keeps the unique needs of women front and center. As a goals-based robo-advisor, Ellevest lets investors choose what financial goals their portfolios are targeting. Investors can also expect tax-minimization strategies. Advice and Account Types: Depending upon the plan, users can speak with financial advisors (Premium plan) or receive online digital investment advice. The available accounts include taxable investment individual and joint brokerage accounts as well as Traditional and Roth IRAs. Overview: Vanguard Personal Advisor Services require a $50,000 minimum balance. Despite the high minimum, Vanguard is the robo- advisor with the most AUM at $112 billion as of August, 2018. All accounts are driven by a financial advisor, first and digital investment advice (robo-advisor) is secondary. Accounts valued at over $500,000 get access to a dedicated personal financial advisor, while those below this cutoff have a team. Advice and Account Types: In exchange for this high initial investment and middle-road fee structure, Vanguard provides all investors with access to human financial advisors. Vanguard’s menu of account types includes; individual & joint investment accounts, Roth, traditional, SEP, Simple & rollover IRAs. Trusts are available too. 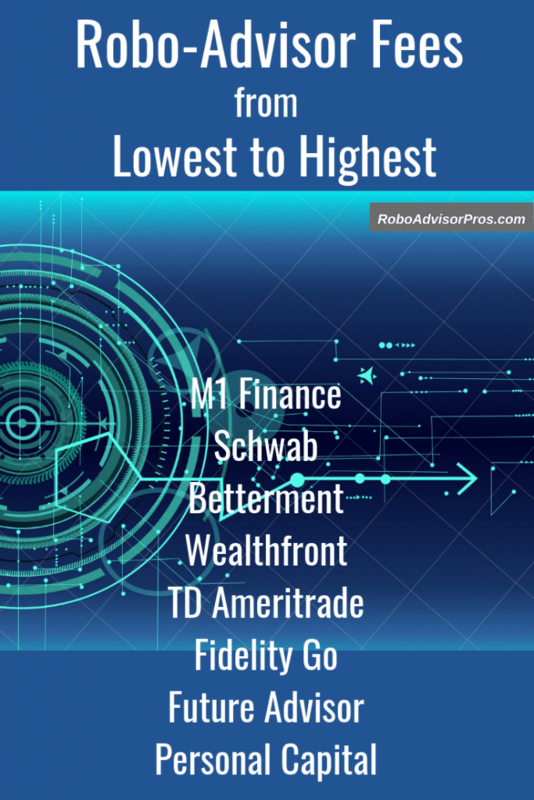 Overview: Sitting squarely in the middle of our list of robo-advisor fees from lowest to highest, TD Ameritrade does have one of the higher minimum investments: investors will need $5,000 to get started investing. TD Ameritrade offers two digital investment platforms; Essential Portfolios is fully automated while the Selective Portfolios offers passive and active investment options. The investment portfolios are designed by well-regarded Morningstar to meet various risk preferences, so aggressive and conservative investors alike can feel confident in their investing options. Advice and Account Types: Essential Portfolios is fully automated while the Selective Portfolios offers a hybrid model and includes human financial advisors. TDAmeritrade boasts among the widest range of account types: investment accounts, IRAs (including Roth, traditional, SEP, SIMPLE, and rollover), trusts, business accounts, 401(k)s, and UTMA accounts. With all the different offerings, there’s something for almost everyone! Overview: This robo-advisor has a relatively high minimum investment, coming in at $5,000 for minimum account balances. Still, Fidelity Go offers some neat services, including target tracking to make sure you are on-track for financial success. This is an easy way for investors to make sure their investments are doing what they’re supposed to—growing! Advice and Account Types: Investors can expect automated advice that adjusts based on your investment portfolio and likelihood for success. The company provides 24/7 customer service. FidelityGo offers investment and retirement accounts, and is made up of combinations of mutual funds and ETFs. Overview: Wealthsimple has no minimum balance requirement for their automated robo-advisor platform. This robo-advisor offers Halal investment options as well as socially responsible investing and diverse index funds. Just like other robo-advisors, Wealthsimple offers portfolio rebalancing, dividend reinvesting, and automated investment advice. Advice and account types: During normal business hours, investors can expect to reach Certified Financial Planners via phone. Investors will find most standard types of acccounts from individual and joint taxable accounts to trusts; traditional, Roth, rollover and SEP IRAs. Overview: SigFig manages funds held at TDAmeritrade, Schwab, or Fidelity. SigFig regularly monitors and analyzes portfolios, and makes tax-efficient recommendations or rebalances according to optimal portfolio allocations. Investment minimums are $2,000 for Asset Management Services, and $100,000 for Diversified Income Services. Advice and Account Types: Investors can also expect investment advice from human financial advisors. SigFig offers individual and joint investment accounts as well as Roth, traditional & rollover IRAs. They also offer trust accounts. Fee Structure: 0.50% AUM, additional charges possible through TDAmeritrade or Fidelity. Overview: You’ll be able to use FutureAdvisor’s investment planning recommendations with no minimum balance, but a $10,000 minimum investment is required for premium account management. FutureAdvisor works as an account management robo-advisor for assets held at TDAmeritrade or Fidelity. If you have an existing account at either firm, FutureAdvisor can mange your investments. Advice and Account Types: Premium users can access financial advice from human financial advisors and automated advice alike. Account types include investment accounts and IRAs, plus 401(k) accounts from Fidelity. Fee Structure: No fees for investment and portfolio management toolkit; sliding fee scale, such as 0.89% AUM for accounts between $1 mil-$3 mil to 0.49% AUM for accounts over $10 mil. Overview: While Personal Capital offers superb free financial tracking tools, their fees are rather hefty for investment management in comparison with other automated advisors. The fees drop as account values increase, which is great news for those with high-value portfolios. Their platform offers funds, individual stocks and bond investments. Personal Capital requires a minimum $100,000 investment. 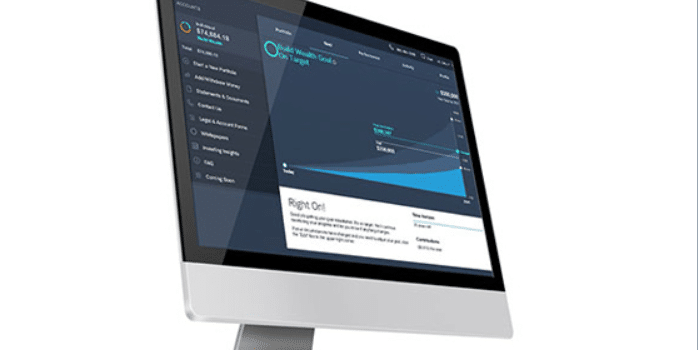 Advice and Account Types: The free investment tracking tools offer automated advice, but users who pay for investment management services can expect access to a human financial advisor. Investors can open investment accounts, IRAs, or trusts. There are robo-advisors available with a wide range of fee structures. While completely free robos may seem like the no-brainer decision, sometimes additional fees can mean additional services. Investors will always need to weigh different criteria to decide which robo-advisor is best for them. This list showed robo-advisor fees from lowest to highest, but it also included minimum balance requirements, account types, and whether access to human financial planners is possible. All of these are important features to consider before investing in a robo-advisor.